While in Durand for the arrival of Southern Pacific 4449 we had a little rain. joseph645 borrowed a disposable orange poncho (which we've had in the Element for a good two years and used about 5-6 times) to shelter him and the camera from the rain. Fortunately it never came down hard and stayed maybe a little more heavy than a dizzle. 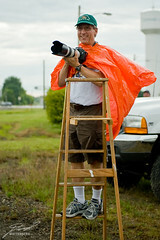 He had brought a ladder with him to get some better shots and seemingly to pick-up a little extra wind.